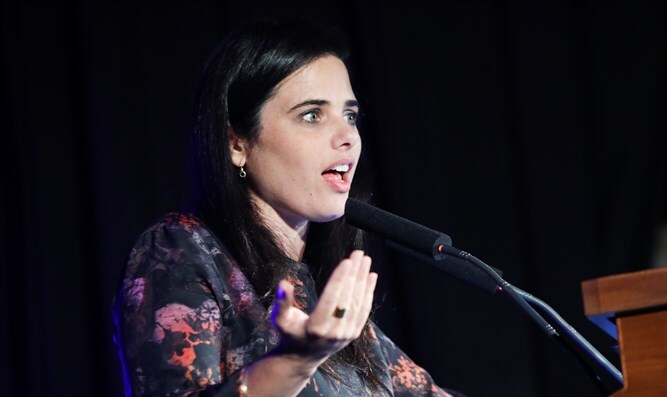 Minister of Justice Ayelet Shaked discussed Sunday on Reshet Bet the decision she and Minister Naftali Bennett made to resign from the Jewish Home party and to form a new party. "The Jewish Home is a wonderful party, but it is a religious party. We are not a religious party," Shaked noted in response to the question of why the New Right party was needed. "When we sat down, secular and religious representatives, and thought about the way to a joint life here, we thought about the Gavison-Medan Covenant," Shaked explained, "but we have to update the agreement to 2019 and find solutions." "We want to establish a public committee that will abide by the spirit of the covenant, update it, and find solutions, but the spirit of the convention is the right spirit," she explained. Shaked was asked about specific issues, such as the construction of the Yehudit Bridge on Shabbat or desecration of Shabbat over the Eurovision Song Contest, but refused to comment on the details. "I do not want to go into details at this point. I want to explain in a general sense, in the State of Israel there are secular, religious, and haredim, each one must find the way to live together. We must look at what unites and not at what separates." "I have not changed my ideology, my ideology is the same. We have established a party that puts cooperation at the center, and I think that through dialogue between religious and secular every problem can be solved," she added.